Aringoth is the Altmer owner of Goldenglow Estate, a bee farm outside of Riften which used to supply honey to the Black-Briar Meadery. The Thieves Guild made sure the operations ran smoothly and would extort considerable payment from Aringoth. Lately, he has stopped shipments, fortified the island and hired an army of mercenaries, infuriating Maven Black-Briar and causing the Guild to single him out for punishment. Befitting his status, Aringoth wears fine clothes and boots. He is armed with a leveled dagger, leveled bow, and up to 144 arrows of various qualities up to daedric, all limited by your level. He also carries a key to his cellar, a key to his safe and up to 45 gold coins. Once you've broken into the estate, Aringoth will be found crouching in his room on the second floor. As soon as you come close he'll spit: "Worthless mercenaries. I didn't think Maven or Mercer would allow me to get away with this, but I had little choice." Ask him for the safe's key and he'll refuse, terrified: "I can't. If I do, I may as well cut my own throat." If you successfully persuade him to hand over the key he'll sigh: "Fine. Take it! Once the new owner finds out I gave in, I'm as good as dead anyway." Questioning him about this will net you little: "I've already said too much. I gave you what you came here for, now go. Leave me in peace." However, he may also see right through you and say: "I don't believe you. That's not your way." If you fail, you can challenge him to a fight or try to walk away, at which point he'll say either: "Give it your best shot!" or "No! I'm not about to let you ruin everything I've worked so hard for!" He will then proceed to attack you. If left alive, he will remain crouched in the corner for the rest of the game. 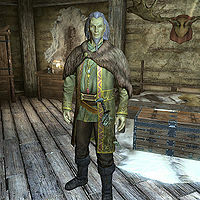 Aringoth was intended to be a Bosmer, as Brynjolf, Vex, and Mercer Frey all refer to him as a Wood Elf. This page was last modified on 18 October 2018, at 07:05.